^ A Governess's Duties 页面存档备份，存于互联网档案馆, Outback House (Australian Broadcasting Corporation). ^ McDonald, James Joseph, and J. A. C. Chandler. Life in Old Virginia; A Description of Virginia More Particularly the Tidewater Section, Narrating Many Incidents Relating to the Manners and Customs of Old Virginia so Fast Disappearing As a Result of the War between the States, Together with Many Humorous Stories. Norfold, Va: Old Virginia Pub. Co. 1907: 241. ^ Ellis, Phyllis. Desert Governess: An Inside View on the Saudi Arabian Royal Family. London: Eye Books. 2000. ISBN 1-903070-01-5. 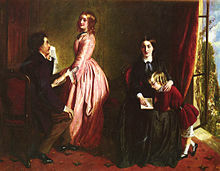 ^ Harris, Julia: A career as a Governess? What skills do you need?, Australian Broadcasting Corporation, 15 October 2004. ^ Telegraph.co.uk, The Telegraph, 15 March 2009. Budde, Gunilla: Als Erzieherinnen in Europa unterwegs: Gouvernanten, governesses und gouvernantes, EGO – European History Online, Mainz: Institute of European History, 2011, retrieved: 21 February 2013. Peterson, M. Jeanne: "The Victorian Governess: Status Incongruence in Family and Society", in Suffer and Be Still: Women In the Victorian Age, ed. Martha Vicinus. Bloomington: Indiana University Press, 1972. VAM.ac.uk, Richard Redgrave's 'The Governess' discussed at the V&A Museum.